Natural color diamonds are unique as they exist in almost every imaginable color, size and price range. Natural color diamonds vary from the faintest shade of pastel pink, brown or yellow to the most deep or vivid shade of blue, green or orange. The rarer the color, the more valuable the Natural Color Diamond. Some diamonds can contain secondary colors (modifier), which could increase or decrease the diamond’s value. According to the Gemological Institute of America (GIA) that only 1 out of every 10,000 diamonds mined is a natural color diamond. The rarest of these diamonds truly are one-of-a-kind gems. The darker and more intense the color, the rarer and more valuable the Natural Color Diamond. 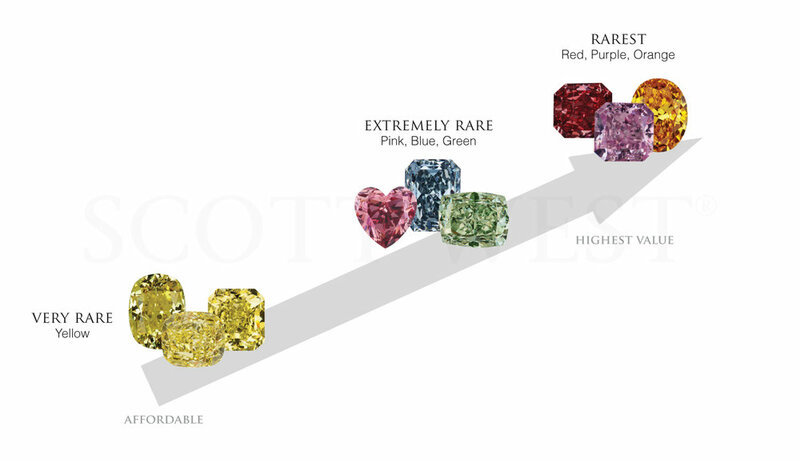 The strength of color is one of the most important factors in determining the value of a natural color diamond. The value of a natural color diamond increases with the intensity of the most prominent color within the diamond. In an attempt to bring some uniformity to the industry description of Natural Color Diamonds, gem analysis laboratories have developed the fancy color diamond color scale to classify the strength or intensity of a diamond's color. If the color and intensity is equal, the larger the size, the more valuable the Natural Color Diamond. Natural color diamonds are cut into a variety of shapes. The shape and cut of a diamond selected by the diamontaire is the one that will maximize the color, and is most appropriate for the model of the rough diamond crystal. Skilled cutters fashion these diamonds we admire by creating beautiful misaic patterns of color that sparkle like no other gemstone. Diamond cutting centers are located predominantly in Antwerp, New York, Israel and India. Weight is sacrificed to obtain better color, a better make…or better clarity in a diamond. However, every bit of carat weight counts because these diamonds are sold based on their carat weight. Some extremely valuable diamonds such as vivid pink and blue have been sold at auctions in excess of $1M/ct. This translates to $10,000 for every percent of a carat lost during cutting.